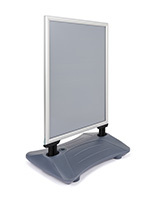 This 24” x 47” write-on board w/ wheels has a “tip and roll” design” that makes it easy to transport from one venue to another, and great for storage. 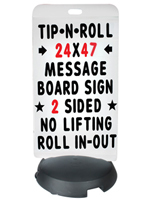 With tracks for (7) lines of copy on each side of the sign, this changeable message board is the perfect advertising tool. 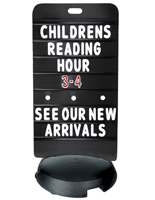 With (314) 4” numbers, letters, and symbols, and (22) 8” numbers, plus (2) 9” headers for-sale items and special announcements, this write-on board w/ wheels, such as a sign kit, is an effective marketing station. 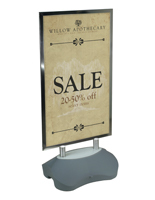 The tip and roll design of this mobile sandwich board with a changeable display makes this signage easy to maneuver through narrow hallways. The base can be filled with sand or water to 1-1/2 gallons to keep your advertising presentation from tipping over in heavy foot traffic or windy weather.